Caddick Construction, the family-owned Yorkshire-based construction company, has capped off a strong summer of activity with nearly £50m worth of new contracts secured across Yorkshire and the North. The projects cover a wide range of uses, from car showrooms to research facilities, demonstrating Caddick Constructions ability to deliver across a range of sectors. The largest new scheme for Caddick Construction is a new automotive retail centre at TraffordCity in Manchester. This includes new showrooms for for BMW, Jaguar Land Rover and Mini in a flagship location next to Event City. In addition to this are contracts for a new Jaguar Land Rover showroom in Nelson, Lancashire and a full refurbishment of a Porsche showroom in Newcastle. The company is engaged on a number of new industrial projects as well, including a new development in Leeds on behalf of Towngate which will create over 115,000 sq. ft. of industrial and commercial space. Caddick Construction have also been awarded the contract to help overhaul Alderley Science Park near Macclesfield. The North of England’s leading science facility is home to the UK’s largest bioscience campus and Caddick Construction will refurbish and expand existing lab space. 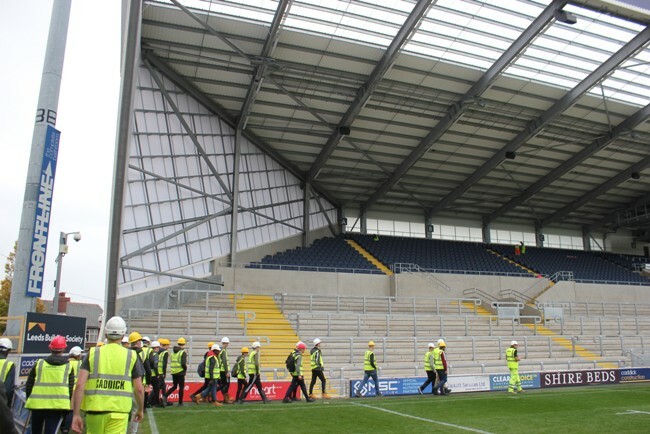 Closer to home, the Wetherby-based firm is helping deliver the new South Stand at Headingley Stadium and a replacement of the joint rugby and cricket stand, as part of a £40 million redevelopment of the iconic sporting venue. Caddick Construction and Caddick Civil Engineering are the operational arms of Caddick Group PLC. Offering more than 35 years’ experience across a range of market sectors including commercial, education, industrial, leisure, refurbishment, residential, care, retail, mixed use and fit out. The Group employs almost 500 people and its turnover exceeds £150 million. Caddick Construction was recently recognised as a considerate constructor and the Considerate Constructors Scheme’s National Site Awards and was named one of the top ten contractors with a turnover of under £250m at this year’s Construction Enquirer Awards.